Made in Italy by Industria Macchine Elettroniche ("a company of the Edison group") about 1967. Capabilities - 4 functions, memory. Display - 12 digits, "Nixie"-type numerical display tubes. 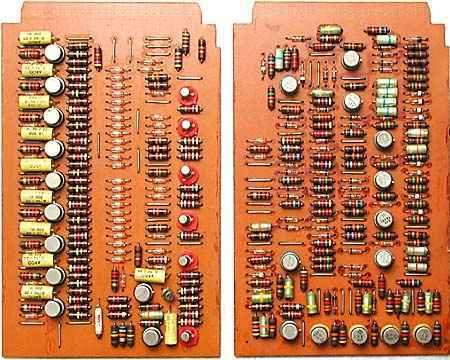 Technology - The 24 logic boards have a total of 424 Germanium transistors and 1074 Germanium diodes. It has a magnetic core memory. Size - 450 x 480 x 165 mm (17.75" x 19" x 6.5"), 14.6 Kg (32 lbs). 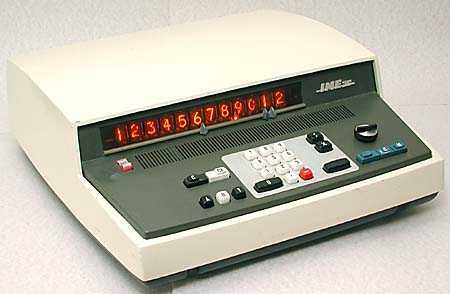 The IME 26 is a simplified version of the earlier IME 84, with which it can be compared, and was promoted for "all commercial arithmetical operations". An advertisement in February 1968 said "Has instant recall on three operational registers. This is the important feature exclusive to the IME 26 enabling the last operation in each case to be recalled for verification or further processing." The "A" key displays the contents of the 1st operation register (the first operand of multiply/divide, or the last number added). The "B" key displays the contents of the entering register (the second operand of multiply/divide). The "T" key displays the contents of the result (total) register. The knob on the right selects the decimal point position, the "C" key is the Initial-clear key, and the "CK" key clears whichever register is being displayed. The black key marked ":" is for division, and the large black, unmarked, key at the bottom below the "X" key is equivalent to a "+=" key. The blue "C" key clears the auxilliary register. 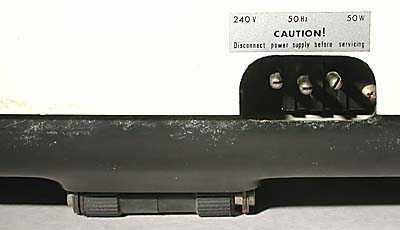 The "M" key displays the contents of the auxilliary register. The blue unmarked key adds the number being displayed to the auxilliary register. The keyboard of this machine has the same oddity as that of the IME 86 in that when a number key is pressed the number does not appear on the display until the key is released. There are wheels at the rear to aid moving this heavy machine on a desktop. 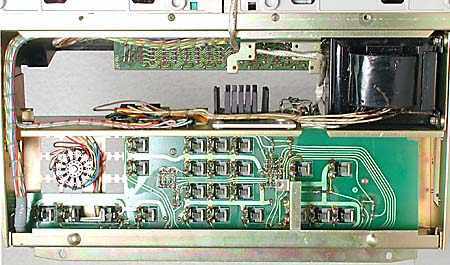 The covers are easily removed to reveal the electronics for servicing, with the 26 circuit boards held in two racks. 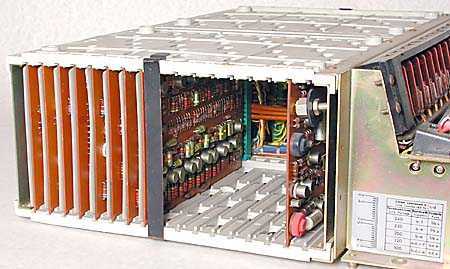 This chassis was used by several IME calculators, including the IME 84 and IME 86. Unlike the IME 84, the keyboard decode logic is not beneath the keyboard, but in the racks. The main power supply is between the keyboard and the racks of electronics. Looking underneath the keys at the crude contact arrangements. Each plastic key presses a bent finger of metal against a pair of adjacent contacts. 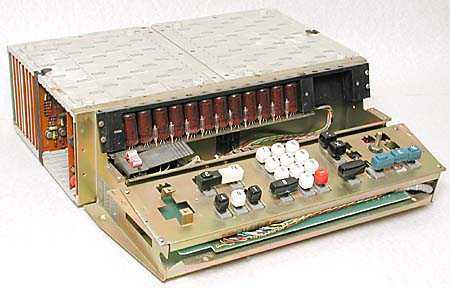 Since the IME 26 has less digits in the display than other similar IME machines it requires less electronics, which is shown by the partially populated left rack. 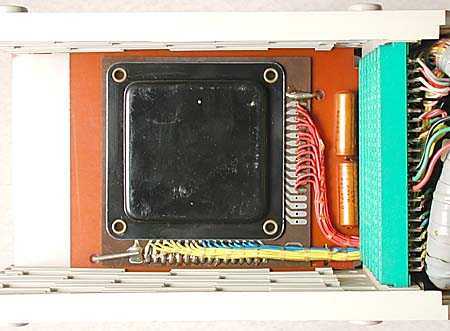 White, plastic, insulating sheets are inserted between the closely spaced circuit boards. The board sitting alone on the right provides the power supplies for the logic boards and the magnetic core memory. As with the IME 84, the magnetic core memory is contained within a low profile plastic box on a shorter circuit board which is hard-wired rather than plugging in. Note that only 12 of the vertical connections to the magnetic core are used, reflecting the 12 digits of the display.Click here to go to the page describing magnetic core memories. The connectors for the circuit boards are all individually wired. 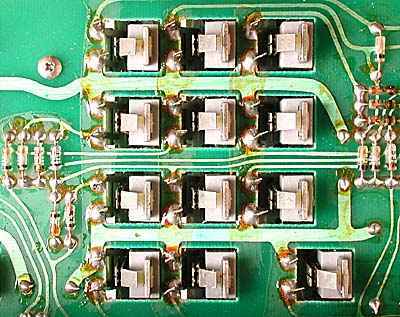 All of the boards have copper conductors on one side only. 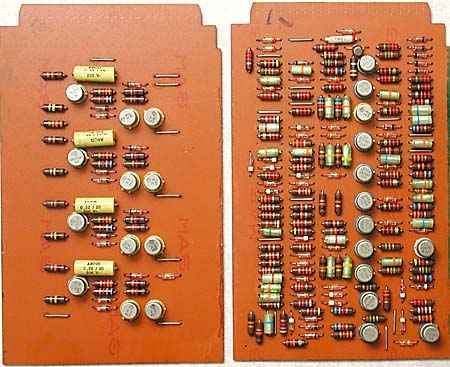 From Texas Instruments, types 2N398, 2N1305, A6, and GA3022C.